کلینت ایستوود (اینگیلیسجه: Clint Eastwood) آمریکالی فیلم یؤنئتمنی, فیلم یاپیمجی‌سی, موسیقی‌چی و اوْیونچو. ۳۱ مئی ۱۹۳۰ ‏ ایلینده آمریکادا دۆنیایا گؤز آچیب. 1954–گۆنوموز ایللر آراسیندا سینما ساحه‌سینده چالیشیب. Eastwood has been recognized with multiple awards and nominations for his work in film, television, and music. His widest reception has been in film work, for which he has received Academy Awards, Directors Guild of America Awards, Golden Globe Awards, and People's Choice Awards, among others. 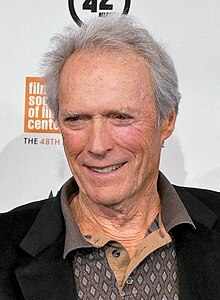 Eastwood is one of only two people to have been twice nominated for Best Actor and Best Director for the same film (Unforgiven and Million Dollar Baby) the other being Warren Beatty (Heaven Can Wait and Reds). Along with Beatty, Robert Redford, Richard Attenborough, Kevin Costner, and Mel Gibson, he is one of the few directors best known as an actor to win an Academy Award for directing. On February 27, 2005, he became one of only three living directors (along with Miloš Forman and Francis Ford Coppola) to have directed two Best Picture winners. At the age of 74, he was the oldest recipient of the Academy Award for Best Director to date. Eastwood has directed five actors in Academy Award–winning performances: Gene Hackman in Unforgiven, Tim Robbins and Sean Penn in Mystic River, and Morgan Freeman and Hilary Swank in Million Dollar Baby. On August 22, 1984, Eastwood was honored at a ceremony at Grauman's Chinese theater to record his hand and footprints in cement. Eastwood received the AFI Life Achievement Award in 1996, and received an honorary degree from AFI in 2009. On December 6, 2006, California Governor Arnold Schwarzenegger and First Lady Maria Shriver inducted Eastwood into the California Hall of Fame located at The California Museum for History, Women, and the Arts. In early 2007, Eastwood was presented with the highest civilian distinction in France, Légion d'honneur, at a ceremony in Paris. French President Jacques Chirac told Eastwood that he embodied "the best of Hollywood." In October 2009, he was honored by the Lumière Award (in honor of the Lumière Brothers, inventors of the Cinematograph) during the first edition of the Lumière Film Festival in لیون, France. This award honors his entire career and his major contribution to the 7th Art. In February 2010, Eastwood was recognized by President Barack Obama with an arts and humanities award. Obama described Eastwood's films as "essays in individuality, hard truths and the essence of what it means to be American." Eastwood has also been awarded at least three honorary degrees from universities and colleges, including an honorary degree from the University of the Pacific in 2006, an honorary Doctor of Humane Letters from the University of Southern California on May 27, 2007, and an honorary Doctor of Music degree from the Berklee College of Music at the Monterey Jazz Festival on September 22, 2007. On July 22, 2009, Eastwood was honored by Emperor Akihito of Japan with the Order of the Rising Sun, 3rd class, Gold Rays with Neck Ribbon for his contributions to the enhancement of Japan–United States relations. Eastwood won the Golden Pine lifetime achievement award at the 2013 International Samobor Film Music Festival, along with Ryuichi Sakamoto and Gerald Fried. ↑ French, Philip (February 25, 2007). "Interview: Clint Eastwood, 'I figured I'd retire gradually, just ride off into the sunset ...'". The Guardian (London). Archived from the original on January 31, 2011. ↑ Clint Eastwood, Ryuichi Sakamoto And Gerald Fried To Receive Golden Pine Awards For Lifetime Achievement. ISFMF (October 18, 2013). یوْخلانیلیبApril 25, 2014. اینگیلیسجه ویکی‌پدیاسی‌نین ایشلدنلری طرفیندن یارانمیش«Clint Eastwood»، مقاله‌سیندن گؤتورولوبدور. ( ۲۲ ژانویه ۲۰۱۸ تاریخینده یوْخلانیلیبدیر). قارداش پروژه‌لرده کلینت ایستوود گؤره داها آرتیق بیلگی‌لر تاپابیلرسینیز. NYFF 2010 \Hereafter\" Press Conference(3).jpg"